The Canada 150 celebrations of the City of Barrie in Ontario were kicked off with a mid-week air show. Ron Cembrowski attended the arrival and media day at Simcoe Regional Airport on June 27 and the air show over Kempenfelt Bay on June 28. Barrie is a city in central Ontario, Canada, roughly 100 km north of Toronto, with a population of over 140,000 and a metropolitan population of over 197,000 residents. The city surrounds the shores of Kempenfelt Bay, on the western arm of Lake Simcoe. To celebrate the 150th anniversary of Canadian Confederation the City of Barrie created "Illuminate Barrie", designed "to infuse the city's popular events and festivals with a uniquely Canadian twist and add some exciting Canada 150 initiatives to showcase Barrie’s ‘true north strong and free’ spirit!" The first event to kick off the 'Illuminate Barrie' Canada 150 celebrations was a free air show performed over Kempenfelt Bay on June 28. The public could view the show from any number of parks along the bay's beautiful waterfront. The air show was held in partnership with Canadian Forces Base Borden and Georgian International Ltd. 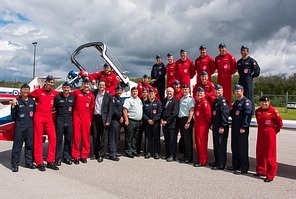 The air show featured the Canadian Forces Snowbirds, CF-18 Demonstration Team, and the Great War Flying Museum (GWFM). 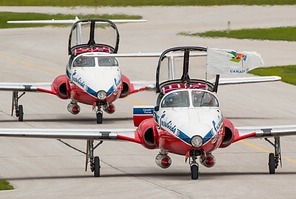 The performers staged out of Lake Simcoe Regional Airport (CYLS), located in the township of Oro-Medonte, approximately 20 km north-east of Barrie. In addition to the flying display, Canadian Forces Base Borden set-up military displays at Heritage Park, on the north shore of the bay, from 1pm - 9pm. 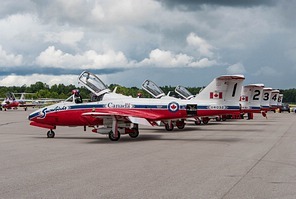 This photo-report covers both the Media / Sponsor day held on Tuesday June 27 at Simcoe Regional Airport and the flying display on Wednesday June 28 from Allendale Station Park on the south shore of Kempenfelt Bay. The Tuesday Media Day activities at Simcoe Regional Airport began at about 11:40am with the arrival of the two Snowbirds coordinators (Snowbird 10 & Snowbird 11). Along with numerous media, sponsors and dignitaries, were members of Royal Canadian Air Cadet 102 'Silver Fox' Squadron. The cadets were treated to a special tour of Snowbird aircraft 10 and 11 and a question and answer session with the Snowbird Coordinators and Snowbird Public Affairs Officer (PAO). The CF-18 Demonstration Hornet, in its special 'Canada 150' colour scheme arrived next at around 1:40pm and gave those in attendance the thrill of several "touch and go" passes before landing and taxiing to the main terminal ramp. \ For information about the CF-18 Demo Canada 150 colour scheme, see our 'Canada 150' CF-18 Demo special report. 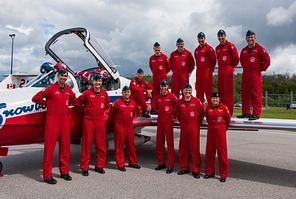 The final arrival of the day was the main Snowbird Demonstration Team at 3:00pm. It's always a pleasure to photograph aircraft arrivals at Simcoe Regional as the main ramp faces north-west, so light conditions during much of the day are very favourable with the sun behind you. As well, one can get very interesting head-on aircraft line-up shots when they turn off of Taxiway C and head south towards the main ramp. This was very true of the Snowbird arrivals with the opportunity to photograph the nine Snowbird Tutor aircraft with some interesting perspectives of the full line moving towards you and then turning off one-by-one to park on the main ramp. It's this type of photographic opportunity that truly makes a good day! Unfortunately, due to weather concerns, the WWI replica aircraft from the Great War Flying Museum did not make the Tuesday media day. Wednesday started out bright and sunny, however as the day progressed the cloud coverage increased. By the time the flying display was scheduled to begin the sky had degraded to largely overcast and milky grey-white haze with disappointingly low light levels for photography. The flying was scheduled to begin at 6:00pm but started slightly later at around 6:30pm. Although the lighting was far less than ideal the show itself was tremendous to watch beginning with a simulated dog-fight from the aircraft of the GWFM consisting of their Red Baron Fokker Dr.1 Triplane, the 85% scale S.E.5.a of James McCudden, the Nieuport 28 of Eddie Rickenbacker and the museum centre-piece, the Sopwith 1-1/2 Strutter. Next up was the RCAF 'Canada 150' CF-18 Demonstration Team Hornet piloted by Captain Matthew Kutryk. Captain Kutryk put on a spectacular aerial display showing the still impressive manoeuvring capabilities of a now aging front-line fighter aircraft. The show closed with the always inspiring flying skills of the iconic 431 (Air Demonstration) Squadron. The Snowbirds continue to uphold the proud legacy of CF/RCAF air demonstration teams that this country has produced, from the earliest pioneer years of aviation through the piston engine Harvard and Mustang Teams into the jet age of Vampires, F-86 Sabres, CF-100 Canucks, CF-5 Freedom Fighters, CF-104 Starfighters and CF-101 Voodoos to the first of the CT-114 Tutor Teams, the Golden Centennaires, formed to celebrate Canada's Centennial in 1967. A closing thought about the air show location; there really is no bad viewing area around the bay. It was even possible for boaters to see the show from the water east of the safety line which had been set up to create part of the air show box. The number of parks that dot the perimeter of the bay provide ample space for the public. The photographs I took from Allandale Station Park on the south-west side of the bay often provided a back-side view of the Snowbirds routine. It was an interesting and rare opportunity to experience the act from a completely different perspective. The Great War Flying Museum is located approximately 60 km north-west of Toronto at the Brampton Airport (CNC3), Ontario. The Museum is operated by the Ontario Aviation Historical Society and is a not-for-profit volunteer member organization. It was founded in 1970 by a group of Brampton Flying Club members. All of the founders were pilots; mostly private pilots and several airline pilots. The Museum was created to honour the pilots who served with gallantry and distinction during the Great War of 1914 – 1918. Their first aircraft was purchased from a well known amateur aircraft builder from Langley, BC. It was an 85% scale British Royal Aircraft Factory S.E.5.a that was dismantled and shipped by truck to Brampton. This is the only aircraft in the GWFM collection that is not full scale. All subsequent replicas are full scale and were built, using modern materials, from original blue prints in the Museum hangar. A special thank you is owed to the City of Barrie staff and to the members of CFB Borden for their kind assistance during Media Day at Simcoe Regional Airport.